On March 26, 2011, seventy cities and forty nine organizations joined forces to celebrate the International Day for the Defense of Life. One of these organizations is the Centro Internacional para la Defensa de la Vida (CIDEVIDA [International Center for the Defense of Life]) based in the city of Oviedo in Asturias. 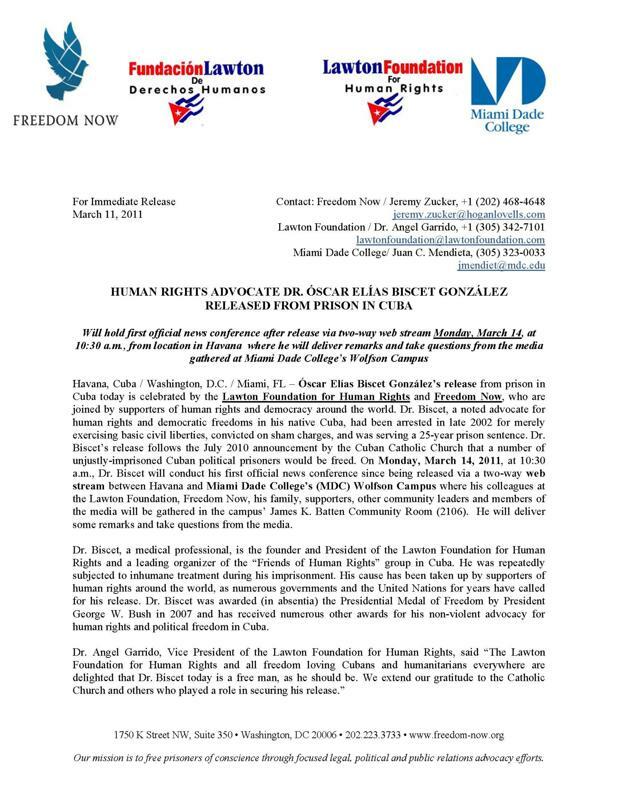 For a long time, the CIDEVIDAS has collaborated closely with the Lawton Foundation for Human Rights which been presided b former prisoner of conscience, Dr. Oscar Elías Biscet. 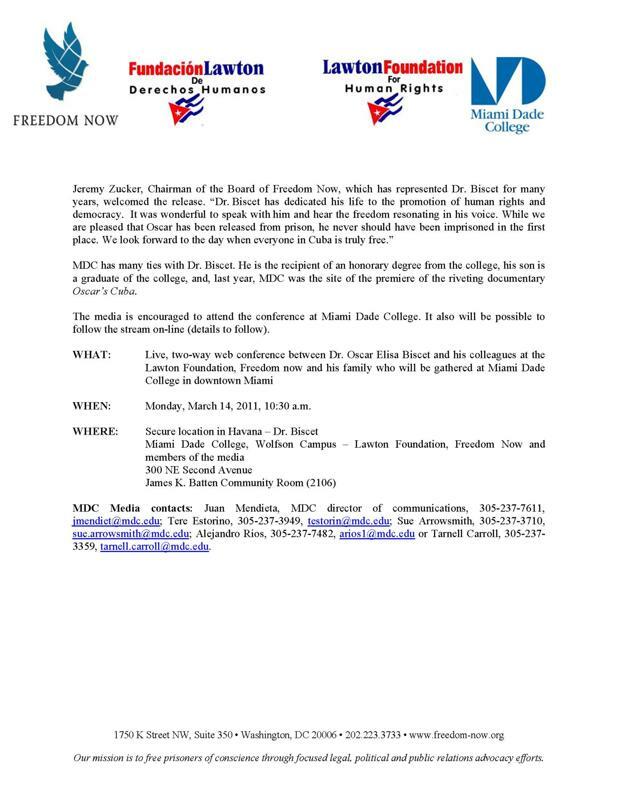 CIDEVIDA’S secretary, Juan José Panizo Izaguirre , and the poet, Efrain Canella, asked Dr. Biscet for a video where he gives testimony of his struggles to defend the rights of the unborn inside Cuba. Thanks to modern technology, Dr. Biscet’s message has been heard and applauded by over two hundred thousand activists of the pro life movement participated in this event all across Spain. The march in Oviedo took place in the Plaza de la Escandalera where Efraín Canella, Dr. Jorge Valdés, former president of the Colegio Médico de Asturias and a hundred members of the association CIDEVIDA displayed signs with Dr. Biscet’s pictures on them. On the same date and at the same time Dr. Biscet and his wife Elsa united in prayer with the millions of people around the world who raised their voices in defense of the weakest and forgotten. At that time, his new cell, Acosta #464, in Lawton, became one more temple where the right to life of the unborn was defended. Revised on March 30, 2011. On behalf of my husband, Dr. Oscar Elías Biscet, President of the Lawton Foundation for Human Rights, on the occasion of the Commemoration of the 62nd Anniversary of the Universal Declaration of Human Rights on the tenth of December. I have been at home for the past 12 days on furlough from prison. During this time, I have undergone medical tests due to the health issues I presented with in prison. I have received a diagnosis of severe hypercholesterolemia and hypertriglyceridemia for which I have been treated urgently. Other medical tests and consultations are pending. Thank God, I am recovering well physically and emotionally from the cruel treatment, abuses and torture to which I was subjected for more than 11 years. I am happy to be with my wife but saddened by the misery my people endure. I am very proud of the men who were in prison with me. In spite of having unfairly endured incarceration for many years, their heart still burns with the desire for liberty. I am grateful to Cubans and the international community for expressing their solidarity by the support they have offered me throughout these past years.